Over the weekend I had the pleasure of attending a friend’s profession of first vows as a Conventual Franciscan friar. Friar Gabriel Mary Scasino is a member of the Immaculate Conception Province of Conventuals. The vow ceremony was held at the National Shrine of St Anthony of Padua, Ellicott City, MD, on the Solemnity of St Joseph of Cupertino (the day was a solemnity because the friary is dedicated to the honor of Cupertino). Friar Gabriel is one of two men who Franciscan Conventuals from New Haven, CT. There is 1 Capuchin also from New Haven. 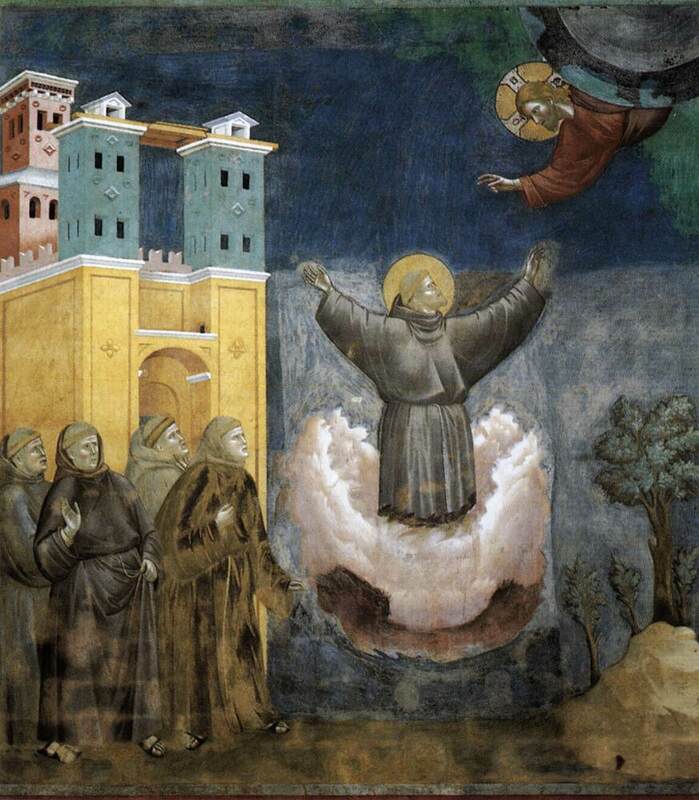 You may ask what is a “Conventual Franciscan”? Some may hear the terms “black Franciscans” or “Grey Friars” or even “community of Franciscans”. All are synonyms. The friars are called “black” or “grey” Franciscans due to the color of the habit worn. Also, it is taught that “By their very nature the three vows bind under pain of serious sin.” Everything we do has some type of implication. 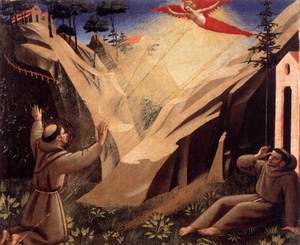 One striking promise made to Gabriel by the Provincial upon receiving the vows is that “if you [Gabriel Mary] observe them [the vows], I promise you life everlasting.” The certainty is what impressed me; the certainty that the Franciscan way of life, if observed, leads one to the personal encounter with God. Very few instances in the Christian life, in addition to Baptism and the holy Eucharist, can make this assertion with faithfulness and Truth. The video of the vow ceremony can be seen here and other pics here. What gift could you possible offer the Trinity, O holy Father, when you possessed but a tunic, breech and cord? What else could you offer the Lord but the triune gift of yourself: the gold of evangelical poverty, the incense of perfect of obedience, and the sweet-smelling myrrh of chastity. In return, out of love for all mankind, the Lord Christ granted you the grace to know His saving Passion in your own flesh. Beg Him to save our souls! What a terrific piece of liturgical theology to meditate on today. The sentiment is not left to those who live the Franciscan charism but for all of us baptized Christians who take faith in the Word made flesh as salvific. I am leaving today for Washington and Baltimore to attend the first vow profession of a friend of mine, Gabriel Scasino, as a Conventual Franciscan. Gabriel is from New Haven, went to Notre Dame High School (West Haven, CT) and is now following the Franciscan charism for his salvation in Christ. He will, as the hymn-writer said above, offer himself to God by giving his whole life to the Lord in “the gold of evangelical poverty, the incense of perfect obedience, and the sweet-smelling myrrh of chastity.” Pray for Gabriel and the Conventual Franciscans to follow Christ more closely today and in the years to come. The Mass prayer for today’s liturgical memorial may be found here. As mentioned a number of days ago I posted a list of religious congregations attracting new recruits in 2010, now the Associate Press has picked up on the trend. I am glad they did. The AP story can be read here. Unremarkable, perhaps quite cliched, is the remark of Dr Catherine Mooney linking the vocations to Pope John Paul II. As much as it goes, the life and work of John Paul led many to to become a member of a thriving religious order. But do you think a theology professor would mention the work of the Blessed Trinity as a source of the call? Relying merely on a pope’s influence doesn’t go to far. Does it? Thanks be to God for those who freely say ‘yes’ to the call of Christ to live the consecrated life. Saints Dominic and Catherine of Siena, pray for us. 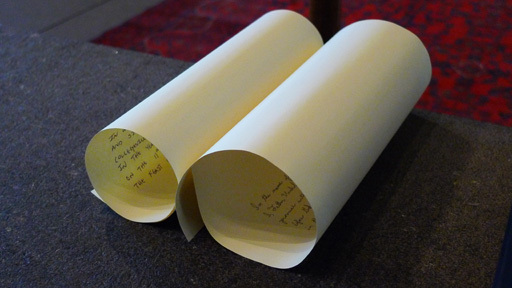 Spring and summer great times in abbeys and great orders because of the ordinations, profession of vows, entrances to the novitiate and the anticipation of such things. God, indeed, provides…God hears our prayers for humble workers in the vineyards. We seek the face of God together, in faith, hope and charity. For last two years I’ve been compiling a selective list of orders that have received new members and noting which ones had professions of vows because I was awe struck by the fact that some people are still being called to do such. That is to say, I am not struck by the fact that God still calls men and women to accept the gift of religious life but that they actually say ‘yes’ to the Divine Invitation to follow Him. I was also curious to know which groups, randomly surveyed, got new members. Leading others to Christ is serious business, so I wanted to know how the Church in America might fare in the future with fewer vocations. For example, the tri-provinces of the Eastern Jesuits (the Provinces of Maryland, New England & New York) admitted only 8 for themselves for 2010. To compare numbers, in the New England Province in 1990, 6 men entered the Jesuit society (only 1 remains today) and in 2010 they admitted only 2 men. Dismal numbers given the beauty of the vocation. What would Saint Ignatius of Loyola say????? Let us note well: Some religious orders or monasteries don’t want anyone to know the facts of professions, entrants or ordinations too readily. This is frustrating because the info should be readily available if a group has a website. There is good reason to believe that many religious are embarrassed by the fact that no one is entering or that with all the money being spent on vocation promotion no one is interested in their way of life as it is lived in that group’s context. Moreover, some orders are not aware of the value of internet technology in today’s era, or are just incapable of find the “right way” to use technology to assist in getting the word out there that life exists in their order or that the charism they’re living is worth living and may be attractive to others. We should acknowledge the fact that some orders are dying (or are already dead and the membership is refusing to admit that their group is dead) but if God has given the grace to come into existence, to abort the charism/vocation too readily and without taking stock in the factors that have contributed to diminishment and the factors of correctives, is perplexing. the wearing of a religious habit not only in the house but in public; if you won’t wear the habit in a restaurant or movie theater or any other place, including the airport, then you shouldn’t be there; the wearing of the roman collar for religious orders should be done by exception if there is a legitimate habit available and the lapel pin just doesn’t cut it. In sum, I’d say that a religious ought to live the virtues we observe in God’s Trinitarian life: be familial/communal with to regard to living, faithfully accepting of another’s differences (the gifts the other brings), maintaining a personal dependence on another realizing that we humans didn’t make ourselves and we really only know ourselves in light the other person, having an attitude for the sharing of resources and the practice of hospitality remembering that we receive guests as though it was Christ Himself knocking on our door. Monastero di Bose (Italy) solemnly professed three, 1 monk and 2 nuns. Saint Walburga Abbey (Virginia Dale, CO) have 3 novices, 1 sister professed simple vows and there are 5 sisters in temporary vows. The abbey has a blog. Saint Emma Monastery (Greensburg, PA) has 1 novice. Benedictines of Mary, Queen of Apostles (Kansas City-St Joseph, MO) have regular vocations but as to numbers, that is unknown. You would have to wait for their newsletter or call them. Abbey of St Paul outside the Walls (Rome) simply professed 1 and there are 2 novices. St Louis Abbey solemnly professed 2 monks, will simply profess 1 and admitted 1 to the postulancy and ordained another to the priesthood in June. Father Bede reports that in the past 13 months there have been a total of 5 solemn professions and D.V. there will be 1 simple profession in November and a solemn profession in January 2011. St Anselm’s Abbey (Washington, DC) simply professed 1 monk. 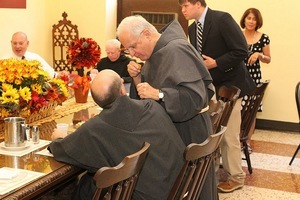 Marmion Abbey solemnly professed 1 monk and admitted 2 to the novitiate. St John’s Abbey 2 monks made solemn vows and 4 simply professed vows; their stories are here; 2 were admitted to the community. 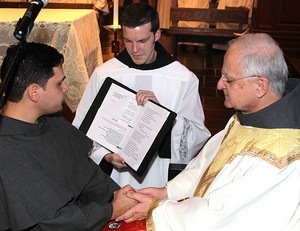 St Mary’s Abbey (Morristown, NJ) simply professed 2 monks on May 1. Four entered the novitiate. St Vincent’s Archabbey ordained 1 to the priesthood, 5 became novices and 4 professed simple vows. The juniorate has 13 monks. 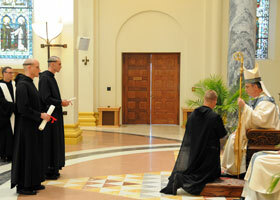 St Meinrad Archabbey ordained 1 priest and 2 professed solemn vows. St Benedict’s Abbey (in Kansas) ordained 2 monks, 1 to the order of deacon and another to the priesthood. St Benedict’s Abbey (in Wisconsin) simply professed 1. Conception Abbey simply professed 1, solemnly professed 1 and 4 entered the novitiate. The Monastery of San Benedetto (Norcia, Italy) had 2 monks profess simple vows and 1 profess solemn vows this summer. The community was founded in 1998 in Rome and in 2000 moved Norcia, Italy. The community grows. The Dominican nuns of Summit, NJ, the Monastery of Our Lady of the Rosary, will simple profess 1 and 1 entered the postulancy. Watch their slide show. The Carmelite Monks (Cody, WY) had 4 postulants enter, 2 enter the novitiate and a perpetual profession. 2 were ordained to the diaconate. 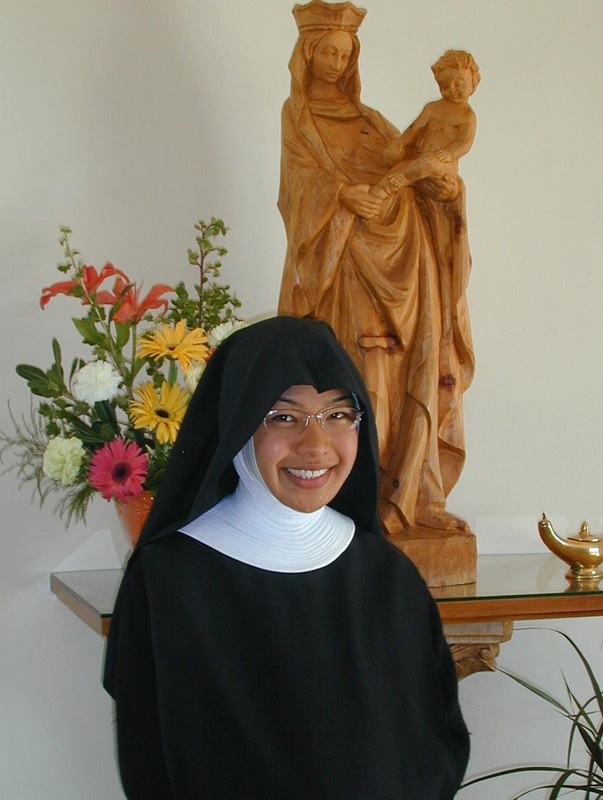 The Norbertine Canons of the Abbey of Saint Norbert (DePere, WI) admitted 3 the novitiate (2 for St Norbert’s & 1 for the daughter house Santa Maria de la Vid in New Mexico); there is 1 novice in the 2nd year novitiate. The Norbertine Canons of Daylesford Abbey (Paoli, PA) admitted 1 to the novitiate, there is 1 2nd year novice, 2 others in formation for priesthood. The Norbertine Canons of the Abbey of Saint Michael (Silverado, CA) 2 professed solemn vows; new postulants were accepted; 1 was ordained a priest and 1 a deacon. The Missionary Fraternity of St Charles Borromeo educates 40 seminarians in Rome and who ordained 3 as priests on June 26; plus there are houses of formation in Mexico and Chile. The Conventual Franciscans of the Immaculate Conception Province simply professed 1 friar; 1 made solemn vows. The Conventual Franciscans of the Province of Our Lady of Consolation received 2 postulants and 1 novice; there was 1 simple profession of vows. The Capuchin Friars of Saint Mary’s Province simply professed 2 friars, and ordained 1; seven student friars renewed vows; 1 friar ordained deacon; 2 novices received the habit. The Capuchin Friars of the Province of Our Lady of the Angels admitted 5 to the postulancy. The Capuchin Friars of the Province of Saint Conrad simply professed 1 friar, 1 novice, 3 postulants and 1 friar ordained deacon. The Capuchin Province of Saint Joseph 2 novices received the habit. 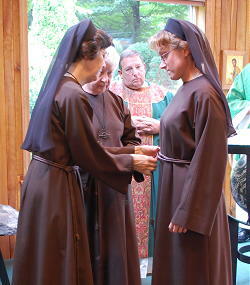 The Franciscan Sisters of the Renewal had 3 sisters profess final vows and 5 take the habit. The Franciscan Friars of the Renewal had 6 friars profess final vows and 10 remain in the novitiate; 4 friars were ordained deacons. The Franciscan friars of the Holy Name Province finally professed 4 friars and admitted 4 men as postulants; 2 friars ordained deacons. The Dominicans of the Western Province ordained 5 men to the priesthood, 3 novices took simple vows. The Dominican friars in Canada had 5 men enter the novitiate. The Dominican Province of St Joseph ordained 3 to the priesthood, simply professed 8 with 21 men who entered the novitiate. The Dominican Province of Saint Albert the Great had 10 men enter the novitiate, 3 make simple vows and 2 make solemn vows; 2 friars ordained priests and 1 friar ordained deacon. The Dominican Missionaries for the Deaf Apostolate perpetually professed 1; 2 are in theological studies preparing for priesthood; the community has 12 members in 2 priories. The Apostles of the Sacred Heart of Jesus had 4 sisters renew vows; 1 professed perpetual vows and 3 entered the novitiate and 1 entered the second year of novitiate. There are also 4 new pre-postulants. The Religious Sisters of Mercy of Alma had 7 sisters finish the first year novitiate. The Sisters of St Francis of the Martyr St George (Alton, IL) 21 junior sisters renewed their vows; 4 professed simple vows, 5 entered the postulant program, 3 entered the 1st year novitiate and 2 moved to the 2nd year novitiate. The Franciscan Sisters of the Eucharist simply professed 1 and received 1 into the novitiate joining 4 other sisters; the FSE also received 1 into the postulancy. The Congregation of St Cecilia, Dominican Sisters of Nashville perpetually professed 5 and simply professed 9; 20 were invested as novices and 26 new postulants entered. The Dominican Sisters of Mary, Mother of the Eucharist (Ann Arbor, MI) had 8 make their simple profession of vows & 5 made perpetual vows. 11 enter the novitiate and 22 enter the aspirancy. Founded in 1997 the congregation has more than 100 sisters. 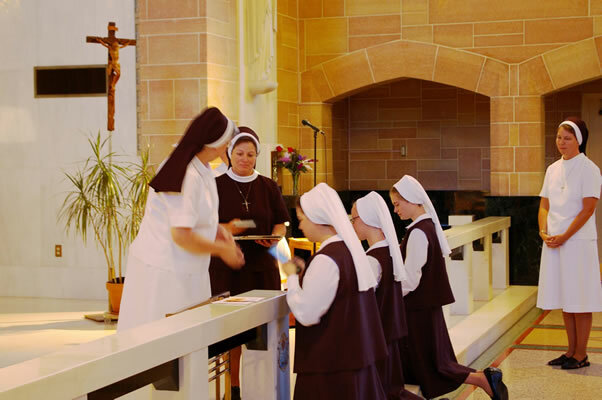 The Sisters of Life simply professed 10 and finally professed 1; 7 sisters began the novitiate. Every man is a vocation, the Pope tells us in the encyclical Caritas in Veritate; he has a vocation. Why? Because man is by nature a being who listens, a given being; before him, there is another who gives meaning to his life. We came into the world because there is someone who loved us first: at the beginning is always love, the gift, and when we consider ourselves, we realize that we feel the need to redirect ourselves toward the source from which we come. We came from the eternal love of God. And when we enter into the mystery of God’s love, we feel almost a fear, a tremor, like the prophet Isaiah. Contemplating the mystery of God, it almost seems like we are dying, because we feel all our fragility and weakness; but when the mystery of God enters into even our fragility, into our weakness, it purifies us. God does not enter into our lives to annihilate us, but to free us and allow life to be manifested in its fullness. And purified by God, we discover untold energy within us, and then if man by himself can do nothing, man with God can do everything. Nothing is impossible for God, and we are called every day- we created beings, we who have a vocation- we are called every day to rediscover the eternal mystery of God, to experience our weakness and fragility, and at the same time, to experience the merciful and renewing grace of God. And on God’s side, under the protection of the Blessed Virgin Mary, with Jesus who has risen and called us to be his friends and brothers, we can do great things. We can be at the service of his kingdom and make the kingdom of God triumph first in ourselves and then by the witness of life we want to give.